Those of you heading to Homefront looking for your typical Jason Statham film are in for a shock. Statham never disrobes. Not at all. He never even strips down to a wife beater. Otherwise, yeah – exactly what you expect. Statham’s a retired undercover cop looking to settle down somewhere quiet and rural to raise his daughter. But a local meth dealer stirs up trouble, and Statham’s Phil Broker has to set things straight…with his shirt on! The film, penned by Statham’s buddy Sylvester Stallone from Chuck Logan’s novel, offers a comeuppance fantasy rooted in a very modern American problem – that our rural areas are now more likely to house meth dens than chicken coops. What can we do about it? I mean, besides create an excuse for a good, decent, law abiding dad to find the bastards responsible and beat them to death? Statham is Statham – unrepentantly British, steely-eyed, quick with his wit and even quicker with an elbow to the face. Kudos to Kate Bosworth as a white trash tweaker and prize winning mom. Not only is Bosworth physically perfect for the role (eat a sandwich, please! ), but she actually acts, giving some heft to her scenes. Winona Ryder also inexplicably co-stars. Why are these two taking tiny parts in a disposable action flick? It’s sad, really, but where Bosworth digs in and performs, Ryder waffles and grimaces instead of acting. Too bad, because she shares most of her scenes with James Franco, and that seems like it could be a pretty nutty experience. 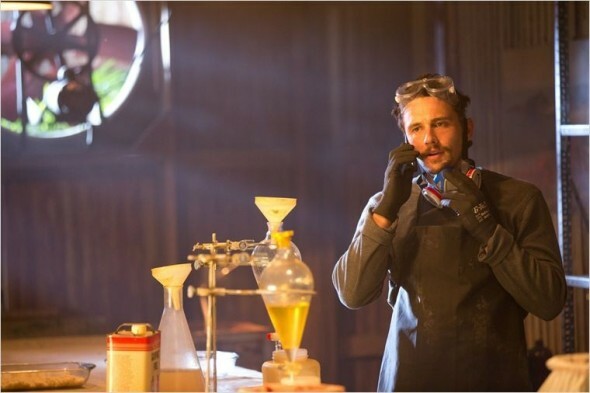 Franco plays Gator, town meth king. Unsurprisingly, he’s the most interesting thing the film has going for it. He’s a very natural presence – no false bravado, no stilted movie-actor-villain-toughness. His Gator is kind of a weirdo. Whether that’s why the role works for Franco, or whether that’s because Franco is in the role is hard to tell, but it’s certainly a big perk for this film. Between Franco’s goofiness and Bosworth’s performance, Homefront does actually contain enough surprises to freshen the tired concept to a watchable degree. That’s not so much a recommendation as a consolation, but hey, at least it’s something.